Before I start your sketch I typically do lots of research. I have extensive files of photographs of various subject matter - files labeled "Dogs", "Wildlife", "Trees", "Grapes", etc. Occasionally, when this reference material does not pan out, I make trips to the library, but most often I have the greatest success searching for my reference material on the Internet. Searches I might launch could be for a particular flower a client wants included in his or her mural, or perhaps a type of boat - anything I am not familiar with. This can be quite time-consuming, but is crucial for a fabulous resulting mural. When I feel confident that I have a complete knowledge of every component of the subject matter of the mural, I begin sketching. 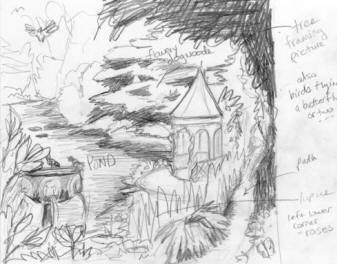 An example of a sketch I created for a client is below, with the finished mural beside it. Each client can scrap their sketch if they are not happy with it, and request a new one. Or, they may ask for changes in the sketch. 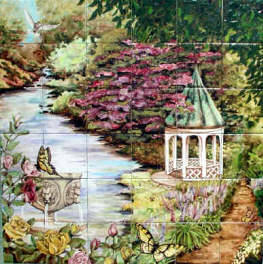 This gazebo garden sketch, for instance, was approved with the understanding that I would add butterflies to the mural. Upon approval of a sketch, I begin painstakingly hand painting the client’s original work of art on commercial field tiles of their choosing. The mural is then fired to approximately 1900 degrees Fahrenheit in one of my kilns, resulting in a rich, visceral, permanent piece of fine art. When the mural has reached my satisfaction, it is carefully packed up and shipped directly to the client. Each tile is marked on the back to ensure ease in putting it back together correctly. Mimi is currently booked out through June, 2018. All images copyright Mimi Ross 1994-2018. All rights reserved.